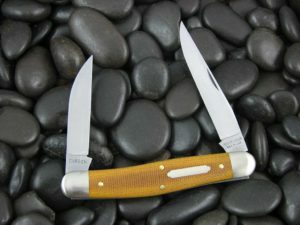 This is the Great Eastern Cutlery Tidioute Boys Knife Pocket Jack, has Antique Yellow Bone handles and Steel liners. The blade steel is 1095 and finish is Satin. The bail and button hanger were custom made by a local company and all were assembled then plated to last a lifetime. It added significant costs to the package, but is authentic to the time. 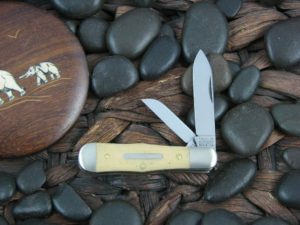 The #15 pattern is my favorite GEC. This particular knife is near perfection. I am a vest-wearer, and the bail and chain are a great feature for me. 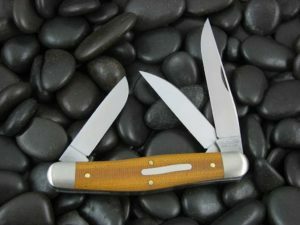 The jigged bone covers are both attractive and of top notch quality. The blade arrived both sharp and well-centered. CollectorKnives is the place to shop for your GECs. 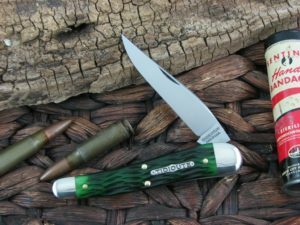 Great little knife! Just the right size. Good walk and talk. Bone color is darker than I was expecting but that’s ok. Chain is beefy and doesn’t feel cheap or lightweight.